As an alternative to having a church organ playing during your wedding service, you may wish to consider one of our classical ensembles to fulfil this role. * As guests arrive at the church and take seats. * Processional music for the entrance of the bridal party. * The signing of the register. * Recessional music for exiting the church. 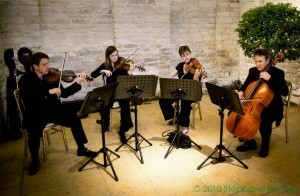 Our guide to wedding music allows you to listen to our String Quartet performing a selection of repertoire often performed at wedding ceremonies and church services. However should you have another piece in mind not listed, then we will be very pleased to discuss your ideas further. 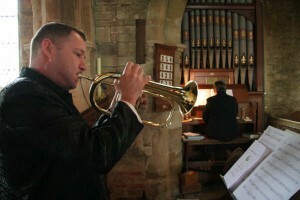 If you plan to have a drinks reception following on from the wedding service, then using the same musicians again will be a cost effective way of continuing the musical accompaniment. Our classical ensembles will change repertoire accordingly, providing a light and fun selection of popular pieces. Useful tip: If an organist is provided by the church, make sure the music is well within the capabilities of the musician. It will take an accomplished organist to perform Widor’s Toccata! Whilst the Bridal Chorus should be achievable by most!